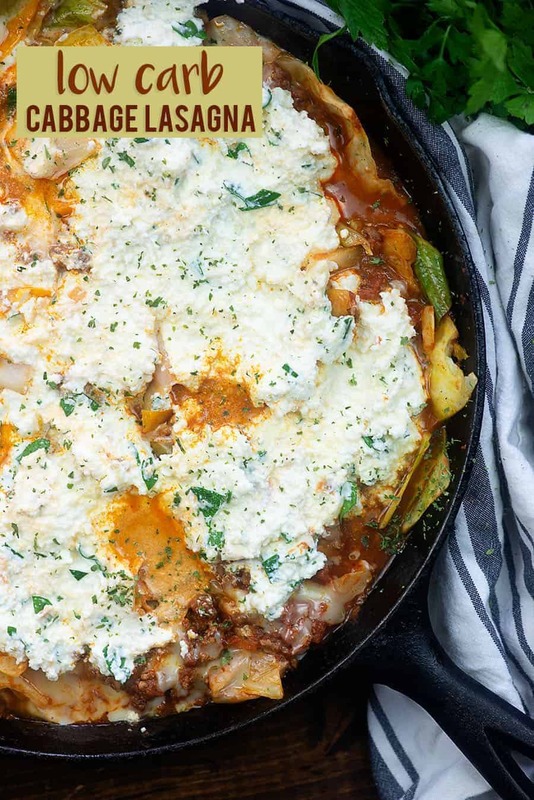 Healthy lasagna made in one skillet with cabbage in place of noodles! This is such a hearty and flavorful dinner that the whole family loves. Plus, it’s a great way to sneak in extra veggies! We’ve never been huge pasta eaters in our house. I mean, sure, the occasional plate of pasta was always delicious, but it’s not something I’ve really missed a lot since going low carb. The other night, though, man. I had a CRAVING. I needed lasagna and I needed it immediately. 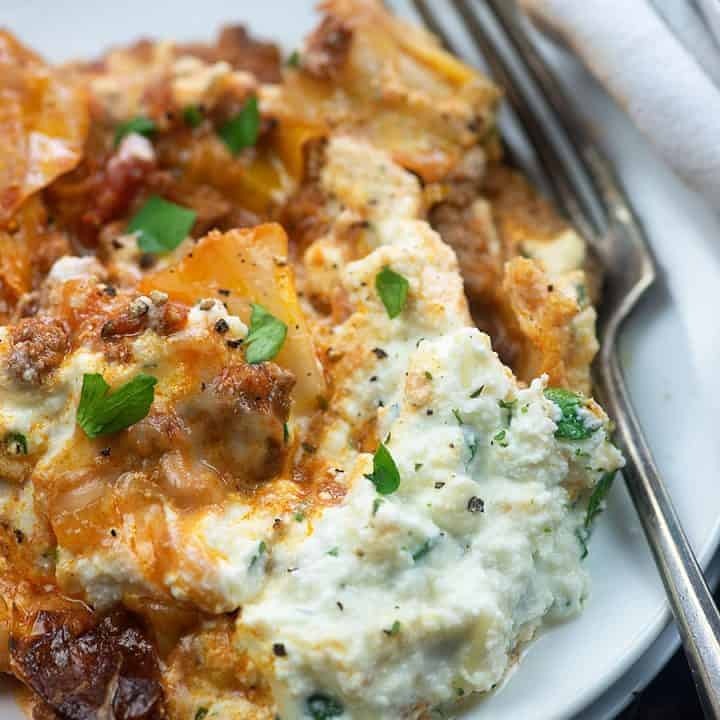 This low carb lasagna is a bit strange sounding, since it’s made with chopped cabbage instead of lasagna noodles, but it just works. No, the cabbage will never taste like a traditional lasagna noodle, but it totally satisfied my craving. 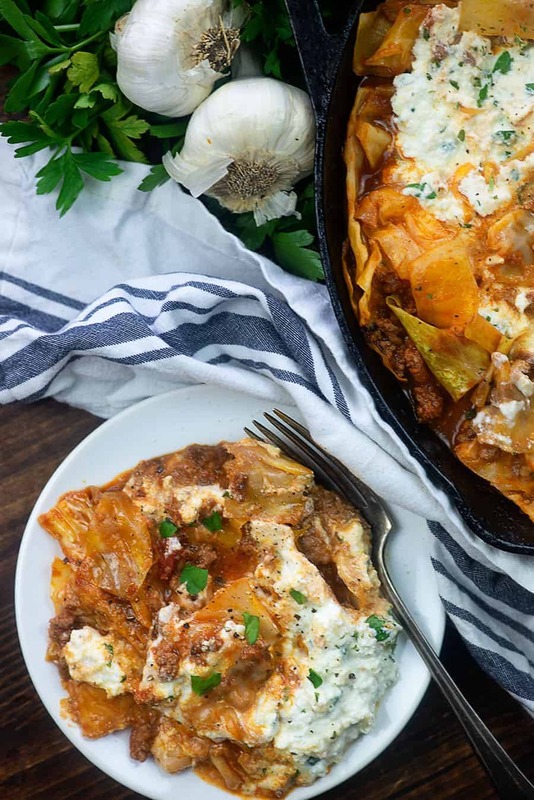 How could a skillet full of saucy beef smothered in a creamy ricotta mixture not satisfy that craving? ? To start, you’ll want to grab a large, deep skillet. I’m using a 12 inch skillet that’s about 3 inches deep. 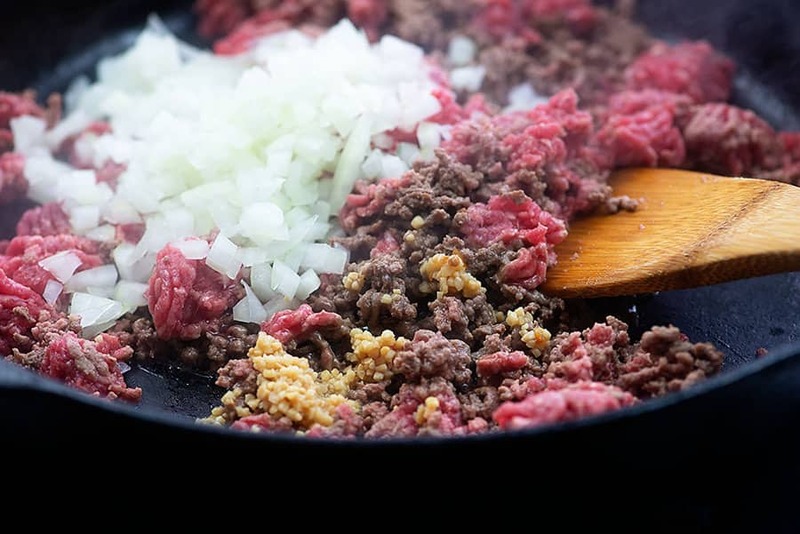 Heat your skillet and add some ground beef. Break the beef up as it cooks and add some onions and garlic to the skillet. I’m using 90/10 ground beef, so I don’t bother draining the fat, but feel free to drain the grease if necessary. Once your meat is cooked through, add in some marinara and a head of chopped cabbage. The cabbage will likely fill the pan, but just very carefully stir to coat the cabbage in the sauce. It’ll cook down quite a bit. Cover the pan and let the cabbage cook over low heat for about 15 minutes or until the cabbage is as soft as you’d like. 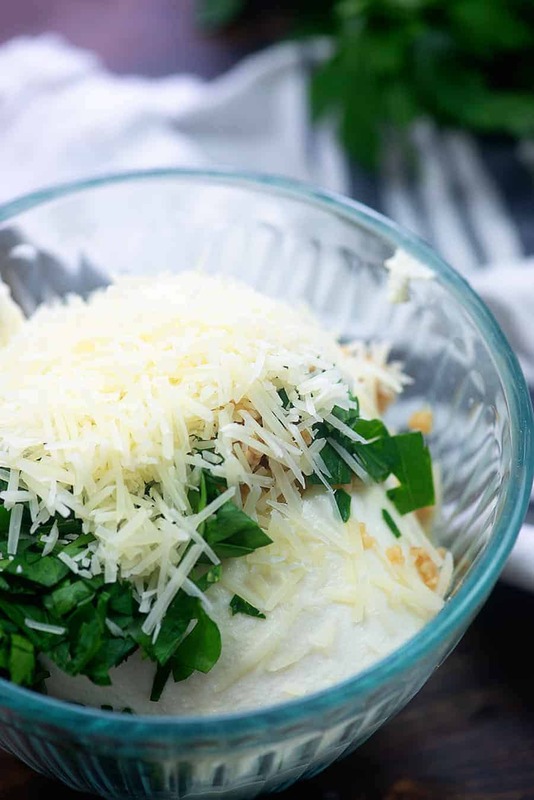 Stir in some shredded mozzarella. You can’t have lasagna without loads of cheese, right? 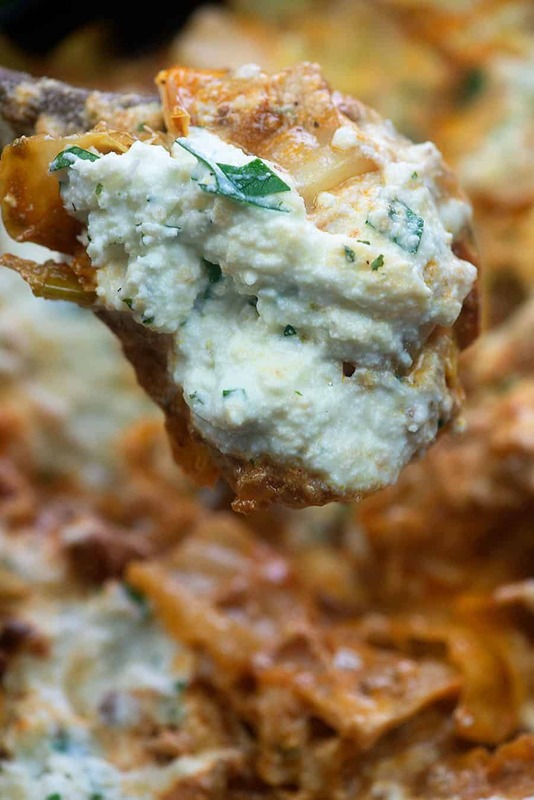 Mix up some ricotta, parsley, Parmesan, and garlic and spread that mixture over the top of your skillet. Cover the dish again and let this cook for another minute or two – just long enough to heat the cheese. That’s it, guys! Easy low carb skillet lasagna! I hope you guys give this a try and let me know what your family thinks! My kids both devoured this one. My littlest was definitely skeptical at first, but once she managed that first bite, she was hooked! Pizza Stuffed Zucchini: hollow out a zucchini and top it with your favorite pizza toppings! Cream Lemon Chicken: This saucy chicken happens about once a week in this house! So good! Garlic Butter Shrimp: If you love shrimp, you have to try this simple recipe. Sheet Pan Chicken and Green Beans: Just about the quickest thing to toss together ever! 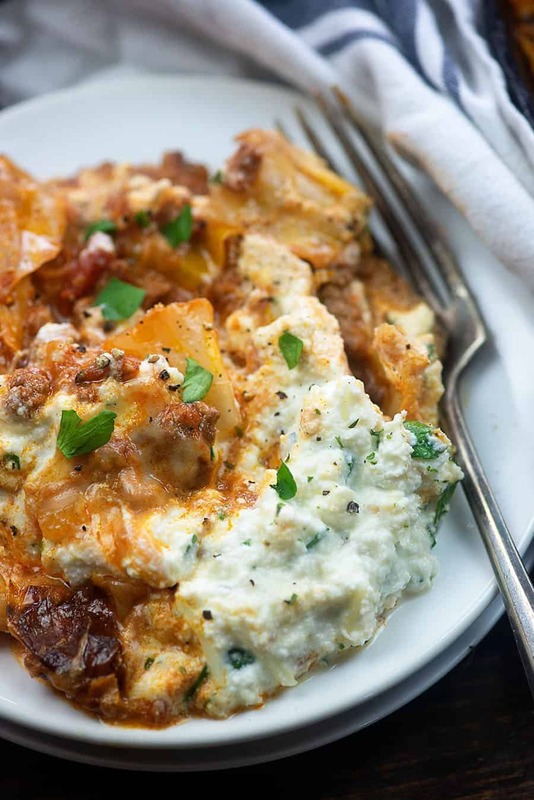 This low carb skillet lasagna is made with cabbage instead of noodles! It's hearty, filling, and will totally satisfy that lasagna craving! Heat a large skillet over medium heat and add the ground beef. Brown the beef until about halfway cooked, breaking it up as it cooks. Add the onion and garlic to the meat mixture and cook, stirring often, until the meat has cooked through. Add the marinara to the meat and stir to combine. 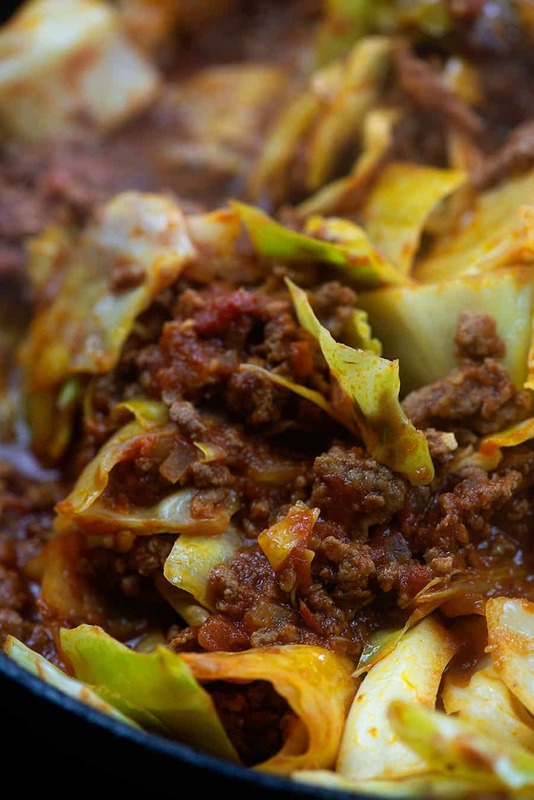 Add the cabbage to the skillet and carefully stir to coat the cabbage in the meat sauce. Once the cabbage has cooked down a bit, cover the pan with a lid and continue cooking for 15 minutes over low heat or until the cabbage is as soft as you'd like. Remove the lid and add the mozzarella to the skillet. Stir well to combine. To make the ricotta topping, add the ricotta, Parmesan, garlic, and parsley to a small bowl and stir to combine. Spread the ricotta mixture over the cabbage and cover the pan and cook over low heat for 2 minutes to warm through. Use any brand of marinara that you prefer. We prefer Rao's brand because it has no added sugar and tastes amazing. Best Low Carb Side Dish Recipes!